Last night I finished Siva Vaidhyanathan’s Googlization of Everything, and rather than being scared away from customized search after reading the book, I find I am more drawn to it, especially when thinking about how to improve search for academic libraries. Dr. Vaidhyanathan argues that Google Scholar is not useful to researchers and that it dilutes the negotiation among opposing ideas through validating the most cited and popular articles with its search results. Okay, I can go there. Where I can’t go is saying that what my institution provides is better than that. And I doubt others can do so at this moment either. Especially as academic libraries morph and redefine themselves, some choosing to require their librarians to have secondary subject expertise, some choosing only to hire subject experts that lack an LIS degree, and some desiring subject expertise which budget constraints then force to span a breadth of subjects rather than support a depth of subject research. I am one of those super Googlers that Dr. Vaidhyanathan is worried about. My Gmail is open whether I’m there or not. It probably logs my inactivity as much as my activity, knows when I’m out jogging or washing dishes or any other offline event I may be involved in. I can see how this is creepy if I’m Google Shopping for shoes, but if this customization means I spend less time pulling my hair out over irrelevant research results, then profile away. My question here is: Can we envision a smarter SmartSearch through student customization? I already have a main profile through the university–why not let libraries take advantage of that and survey me about what my research needs are? I’m imagining a student-controlled personalization portal. Checkboxes could let students update their research preferences that would correspond with metadata from the library’s databases. Students could rate the resources as relevant or irrelevant for certain research needs, or simply answer that question Google asked through its online Help Center: Was this resource useful? This doesn’t answer Dr. Vaidhyanathan’s concern mentioned above. But what about giving those profiles a social media component, a public/private space where students can discuss resources’ pros and cons among themselves? Getting students to engage in online discussion forums is already hard enough, which is why they’re so often mandated as part of a grade. Still, a girl can dream. As an LIS grad student, I am aware of what research my colleagues are engaged in to a limited extent. I can’t think of a centralized space where we can share resources and knowledge. Facebook comes closest, followed by self-organized work sessions. 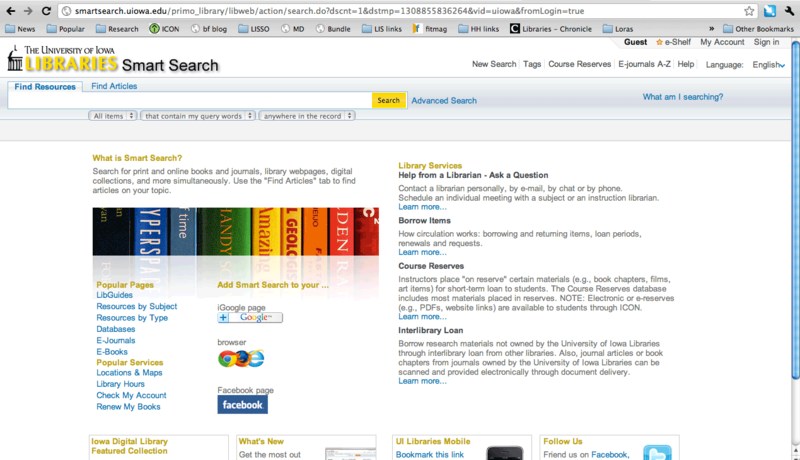 I felt like a traiter going over to Google Scholar rather than use my library, especially as an LIS student. I’m not one of those who believe libraries can’t compete with Google, however. They just have to innovate their approaches, and personalized search could be one such innovation. Do any academic libraries offer this already?